Over the last three years the BSHS has run Engagement Fellowships. These Fellowships are opportunities for postgraduate students to collaborate with museums, archives and other heritage organisations. The collaborations generate new engagement activities, exhibition content or resources that are based on emerging scholarship in History of Science. Over the next three weeks we will be presenting some of the fantastic projects that have been taking place in 2018. 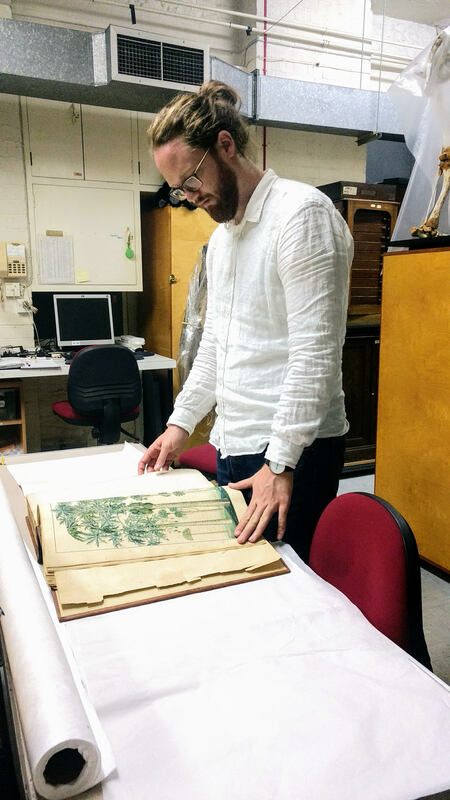 Here below are some early stage reflections from Jason Irving who is working with Rhian Rowson, Curator of Natural History at Bristol Museum to develop projects that connect historic colonial botany collections to new audiences. Jason reflects on the material he is working with and outlines some of his plans for engagement. If you’d like to keep updated on the project, follow Jason on Twitter @foragewildfood or contact [email protected]. If you’re based in the South West you may want to go and see the stall that Jason and Rhian and have been working on for a Museum festival on 21st October. As an anthropology PhD student researching the use of Jamaican medicinal plants I jumped at the chance to apply for a BSHS Postgraduate Engagement Fellowship working on natural history collections from Jamaica. Supported by the fellowship, I have been working with Rhian Rowson, the curator of Natural History at Bristol Museum and Art Gallery, to research the collections and explore engagement opportunities in Bristol. It has been exciting to get to discover the collections at the museum, which I may not have come across otherwise. My PhD will look at contemporary uses of plants, so it is interesting to get a longer view on how these uses developed and see a record of the early introduction of certain plants to Jamaica. The collections in the museum comprise 3 volumes of bound herbaria (1786-1790s) collected from Jamaica by Bristol-born Dr Arthur Broughton; 4 volumes of illustrations of Jamaican natural history and accompanying handwritten text including The Elegancies of Jamaica by Reverend John Lindsay (1758-1788); and an unpublished manuscript of Robert Long containing his theorems on the natural history of Jamaica with drawings (1750s). For this project I have chosen to focus mainly on Elegancies of Jamaica, as it includes illustrations and descriptions of how the plants were used, providing accessible routes into the themes that are emerging from the project. 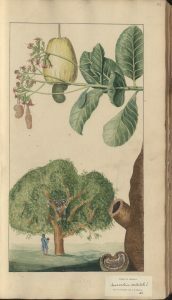 As a pastor in rural parishes of Vere and St Thomas in the Vale, Lindsay became acquainted with the flora and fauna of Jamaica and made illustrations of specimens. He collected specimens himself, and, like other European naturalists in the Caribbean at the time, it is very likely that he relied on enslaved Africans to bring him specimens, though he does not acknowledge their contribution. From these illustrations he began to bind several volumes that also included writings, and, after several years of work, he petitioned the British colonial government for funds to publish his manuscript, which they rejected. He then stopped working on it and it was never published. Four of the original bound volumes survive at Bristol museum, but the fifth volume was lost. The Elegancies of Jamaica volume focuses on both the description of plants and their uses in Jamaica. Lindsay gives descriptions of around 50 plants with illustrations, and there are around 50 more illustrations without descriptions. He details the cultivation of many crops; some introduced from Africa, e.g. bitter gourd Charantia momordica; some from south America, tobacco Nicotiana tabacum; central Asia, pomegranate Punica granatum (via Spain) and from elsewhere, as well as lesser known species native to Jamaica, including some endemics. He often mentions their uses as food and medicine. Knowledge of plants and their uses in Jamaica developed through a combination of Amerindian, African and European influences and imports. For example, okra, Abelmoschus esculentus, was introduced to the Caribbean from Africa through the transatlantic slave trade. Lindsay refers to it as ‘The Ockro’, writing “This plant is cultivated in every Garden, on account of it universal use in almost all sorts of soops”, both the young leaves and the pods which “is so full of a Restorative, Nutrative, & Lubricous Mucilage, that it is pleasing to every Palate & agrees with every stomach.” This preparation has a long and continuing history in Africa, and across the African diaspora in the Americas. Okra is still eaten in Jamaica today, where it is often served with steamed fish, and valued as a health food that can help with weight loss. When writing about the uses of plants, Lindsay regularly refers to their potential to enrich the planter class, both as new commodities and as efficient crops to feed the enslaved Africans as cheaply as possible. Recording the uses of plants by communities was an important step in what later became known as bioprospecting, the theft of knowledge of the natural world for private profit and to support the imperial project. This economic focus was a strong motivation for the study of plants in the 18th century, supporting the development of the discipline of botany, and later systematised in the discipline of economic botany. Botanists were embedded in institutions of empire, studying and moving plants around the world, for use as food, medicine and for producing a wide range of materials. A preoccupation of botanical research at the time was trying to find ways to classify the great diversity of plant life from around the world that Europeans were encountering for the first time. This diversity had disrupted existing classificatory schemes that had previously focused predominantly on European plants. Within the context of emerging bureaucracies of regulation and control of ‘natives’ in settler colonies, the development of systems of taxonomy to classify plants and animals raised the question of the classification of people. The 18th century saw debates among European naturalists and philosophers about the differences between human populations, which they often divided up into groups using the taxonomic language of genus, species, tribe and family. Lindsay himself spent the last years of his life writing an 80,000 word manuscript addressing this debate, with the aim to defend the institution of slavery, prompted by the early signs of the abolitionist movement in the Caribbean and Britain. After discussing existing theories of difference, he argued against ideas of universal equality, writing “there certainly are people and races of men, interspersed by Gods providence, and design’d, or ordain’d by creation, to serve and to be in subjection, to those formed with superior gifts or superior endowments”. Referring regularly to theological discussions, he argues that God created different groups of humans to fit into a natural hierarchy, which he describes paradoxically as ‘reciprocal’. Lindsay had a clear economic interest in defending slavery. In the Elegancies of Jamaica he uses the term ‘our slaves’ when discussing the uses of plants, as he owned people as slaves that worked on his estate. Like many other European naturalists and philosophers of the period, Lindsay benefited from ample free time for academic labour by profiting from the forced labour of enslaved Africans. European biological conceptions of race that emerged in the 18th century influenced the development of scientific racism: people could be divided into a hierarchy of mental and moral capacity that could be judged by the rational observation and classification of physical characteristics. This concept both grew out of and justified centuries of European colonial theft, violence and oppression. 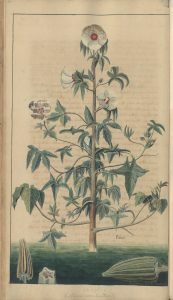 The Elegancies of Jamaica provides an important historical record of plants in Jamaica in the 18th century, their cultivation, and uses as food and medicine, as well as botanical descriptions and illustrations. It was a time when many new species were introduced to the island, which have shaped the social history of its people, and many continue to be used today. I also hope to link it to the long history of the movement of plants and people around the world, that continues today, as can be seen in the availability of many of the plants mentioned in Jamaican restaurants and Afro-Caribbean shops in Bristol. For the fellowship, I will be exploring ways to make the publication more accessible, while situating the work within the specific power relations and theoretical debates of the time that influenced the collection, recording and classification of plant knowledge. This raises many questions about the history of science, and I hope to find space for discussion in the engagement work, rather than simply telling a single narrative. The first that come to mind are, how is the divide between science and other forms of knowledge constructed? How does religious belief sit alongside early practices of science? Who gets to practice science? Whose interests are served by science? How does his direct certain lines of enquiry and avoid others? As a result, whose voices are silenced, misrepresented and devalued? How were claims to objectivity and rationality maintained in the face of clear bias? How have these specific histories affected botany, food, medicine and society today? Higman, B.W., 2011. Proslavery Priest: The Atlantic World of John Lindsay, 1729-1788. University of West Indies Press. Schiebinger, L.L., 2004. Nature’s body: Gender in the making of modern science. Rutgers University Press. Crane, M.D., 1981. Arthur Broughton, a late eighteenth century botanist in Bristol and Jamaica. Archives of Natural History, 10(2), pp.317-330.